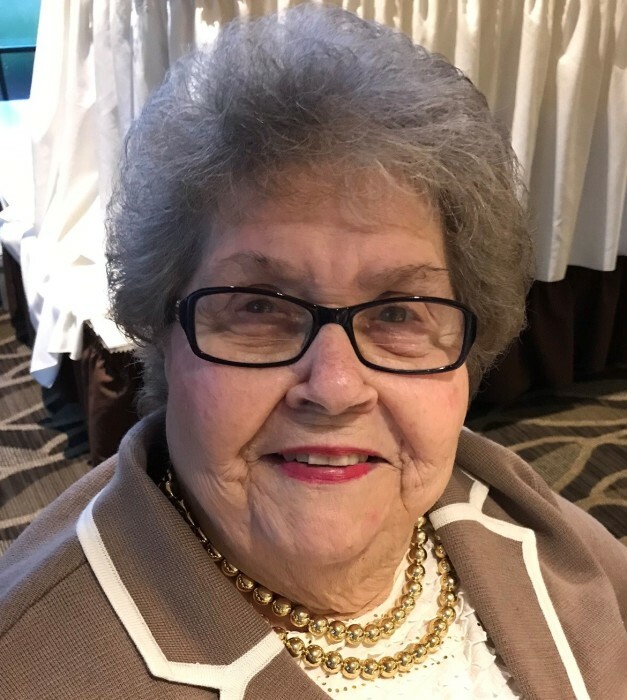 Florence “Flo” Vannes, 87, passed away on Friday, January 11, 2019, with her loving family by her side. She was finally reunited with the love of her life, her husband Ralph (Belgie) Vannes. She was born to the late Henry and Clara (Splan) Johnson on February 24, 1931 in the township of Flintville and then moved to Anston. She loved her life in the country working as a farmer’s helper and did lawn work to buy her clothing for high school. She enjoyed swimming in the neighborhood swimming hole. Sledding and skating were her favorite winter activities. After graduation from Pulaski High School, Florence worked as a receptionist/telephone operator for Pauly Cheese, the Larsen Company and Wisconsin Bell. She later worked for H.C. Prange Company in the Housewares Department for 25 years and the City of Green Bay as a Poll Worker. She also worked for the Green Bay Packers. On November 11, 1950, she married Ralph and nine days later he was drafted into the Army. Upon his return from active duty they purchased their first home and started their family. Florence was a monumental mother and caring for her children and grandchildren was her first priority. She was a friend to all. Many times, the Vannes house was a meeting place for our friends. Flo was an awesome cook and baker. She loved to can, bowl, play cards and visit the casino. She was also a member of the Altar Rosary Society. Florence was a Brownie Leader. Mom and Dad loved to play cards with her sisters and their husbands and was in a card club with her friends. Florence is survived by her devoted children: Gayle Vannes Howard, WI; Laurie Vannes-Treskon (Stephen) Suamico, WI; Cathy Vannes Ashwaubenon, WI; Joe Vannes (Brenda) Howard, WI; grandchildren Craig Elbe, Kristin Elbe, Courtney Fischer (Matthew), Chandler Vannes, Casey Vannes (Rebekah), Connor Vannes, Mark Treskon (Louisa), Matthew Treskon (Teal), great-grandchildren Olivia Fischer, Carter Fischer, Iona Treskon, Adaira Treskon, and Annetta Treskon, sister-in-laws, Arlene Borremans and Gloria Cramer, brother-in-law, Roger Ruf, many nieces and nephews and special friend, Simmi Mosier. She was preceded in death by her beloved husband, Ralph H. (Belgie) Vannes, sisters, Ruth Pamperin, Donna Pamperin, Arlene Conant, Gloria Johnson, brother-in-laws, Donald Pamperin, Jim Pamperin, Don Conant, Robert Borremans, Ralph Cramer, and sister-in law, Karen Ruf, many aunts and uncles. Visitation will be held on Saturday, January 19, 2019 at St. Joseph Parish, 1224 12th Avenue, (corner of Ninth St. and 12th Avenue) Green Bay, from 9:00 a.m. until the time of the mass at 12:00 p.m. In lieu of flowers, a fund will be established in Florence’s name to a charity benefitting the elderly. The Vannes family would like to extend their sincere gratitude to Florence’s dedicated caregivers, especially Nikki Klima. A heartfelt thank you to Kayla, Lise, Tammy, Barb and the entire staff from Aseracare Hospice. Your care, kindness and compassion will always be remembered.